SLASH FT. MYLES KENNEDY AND THE CONSPIRATORS Release New Live-Action, Animated Video For Single "Driving Rain"
SLASH and his band, SLASH FT MYLES KENNEDY AND THE CONSPIRATORS, have released the new video for “Driving Rain”—which features a hilarious live-action, animated adventure with ragdoll puppets--the first single off their new album LIVING THE DREAM. Watch the official video for “Driving Rain” on KNAC.COM HERE. LIVING THE DREAM is available now everywhere via SLASH’s own label, Snakepit Records, in partnership with Roadrunner Records. Purchase the songs digitally HERE and order Limited Edition merch bundles of the album HERE. SLASH describes creating the fun clip here: "The idea behind doing an animated video for "Driving Rain" is mostly due to the dark subject matter of the song influencing directors to come up with very dramatic, dark and sullen regular live action treatments that weren’t any fun at all (no offense to those guys). So, I wanted to create something that could be tongue-in-cheek and yet still be dark with live-action animation. We're all big fans of Stoopid Buddy and they came up with a great concept and treatment. We love the video and it came out fn’ brilliant. Fyi, no puppets were harmed during the making of this video." 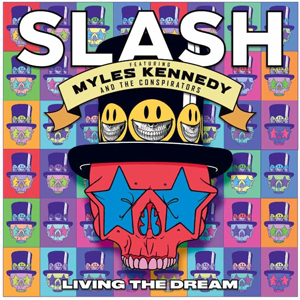 LIVING THE DREAM is the new full-length offering from the group which, in addition to SLASH and singer MYLES KENNEDY, also includes bassist TODD KERNS, drummer BRENT FITZ and rhythm guitarist FRANK SIDORIS. SLASH and his band re-teamed with producer Michael “Elvis” Baskette (ALTER BRIDGE, IGGY POP, INCUBUS) for their third album resulting in the band’s strongest collective statement to date following World on Fire and 2012’s Apocalyptic Love. From the barnstorming, high-octane riffery of opener “Call of the Wild” to the wah-drenched funk rock of “Read Between the Lines”, the haunting majesty of “Lost Inside the Girl” to the swaggering deep-in-the-pocket Seventies grooves of “Serve You Right”, to the stately, quasi-classical melodic themes of “The Great Pretender”, LIVING THE DREAM packs a compendium of sounds and styles into 12 tightly arranged and sharply executed tracks, all of it shot through with SLASH’s trademark electrifying and dynamic riffing and high-wire, lyrical solos.